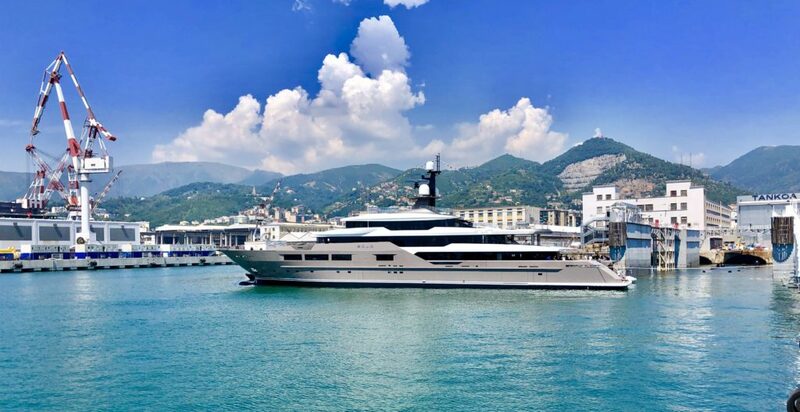 Tankoa Yachts is delighted to announce that 72m Solo project name S701, has been successfully launched August 1st, 2018 in Genoa, Italy. Designed by Francesco Paszkowski – Solo will make her international debut at the 2018 Monaco Yacht Show from the 26thto the 29thof September. Although reminiscent of 69-meterSuerte (project S693), Solo is 3 meters longer and has a volume of approximately 1,600 Gross Registered Tons. Other key differences include catalytic underwater exhausts allowing for substantial gains of volume on all decks, smell free and smoke-free outdoor decks; a larger winter garden; larger aft deck with 6-meter transversal glass pool, cut-down glass bulwarks sections for unobstructed sea views and a wide body upper deck allowing for an oversized panoramic salon. The longer waterline also allows for an optimized top speed in excess of 17 knots and reduced fuel consumption.